A CMS (Content Management System) is simply the software you’ll use to add content – written work, images, videos and other elements such as tables or polls – to your website. A CMS is a method of storing, creating and editing the content for your website. There are many to choose from, such as WordPress, Joomla and Drupal, and hosting companies also offer their own website builders. There are many different types of site builder and CMS available and all will enable you to build a website. WordPress is very popular, because it is free and very well set up to make publishing content very easy. Around a quarter of all websites online are built using WordPress as the CMS. Having a choice for the design of your website is very important. You don’t want to be stuck with a limited choice. 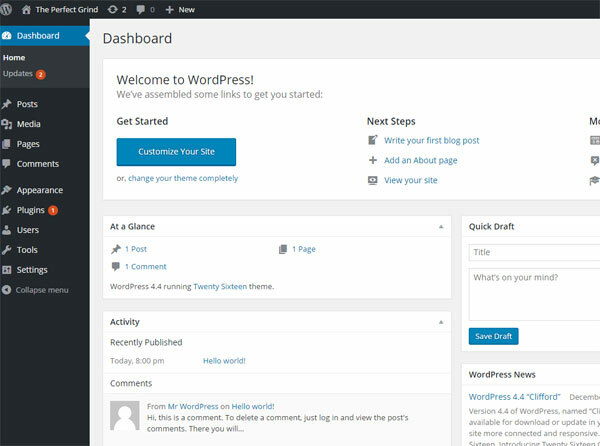 WordPress uses ‘Themes’, which offer a wide range of designs and styles to choose from. There are many free Themes and you can also opt to pay for relatively inexpensive, professionally produced themes. WordPress plug-ins enable you to add features and functionality to your site – there are over 30,000 plug-ins to choose from. Plug-ins are easy to install and offer some powerful functionality. Overall, Amazon recommends WordPress as a beginner CMS, as it’s easy-to-use, search-engine friendly, safe and secure, can be used with different types of media and is highly flexible. It’s also one of the best CMS for beginners. 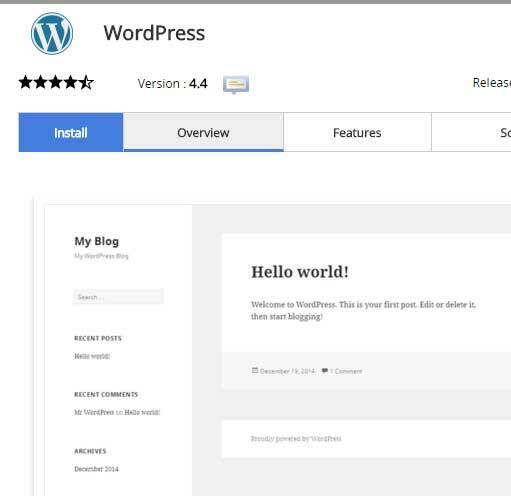 So I click on the WordPress button and then on the Install button. You will then need to fill out some fields. Leave the In Directory field blank and add a site name (without the www), then add a brief description. The description can be changed later, so for now, just include a basic tagline – just a few words describing what your website is about. 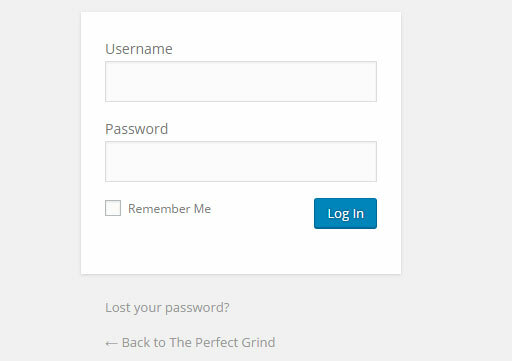 I’ve done that for my website theperfectgrind.co.uk and the setup is shown below. You now need to fill in the Admin username box and the Password information. Do not use Admin as your username, as that makes it easy for hackers. Pick a secure name and password. Like any information placed online, ensure login names and passwords are difficult to guess. You also have to include an email address for confirmation and other details to be sent to you. At this point in the process, various hosting providers offer other options such as installing a theme or particular plug-ins. However, these can all be added afterwards, so I always go with the basic settings. When you click the Install button, a programme runs and it normally takes about a minute for installation to complete. WordPress will now be set up. When you look at your domain name by typing it into the browser, it will now look something like the image below. If it does, then you will know it has been installed properly. You are now officially online! Now, of course, this doesn’t look a lot like a website at the moment, but that will change when we start to work on it, add a theme, plug-ins and some content. The link will always be your domain name with the word ‘admin’ at the end, which stands for WordPress Administration. To log in, use the Admin details you entered during the setup process, and click Login. 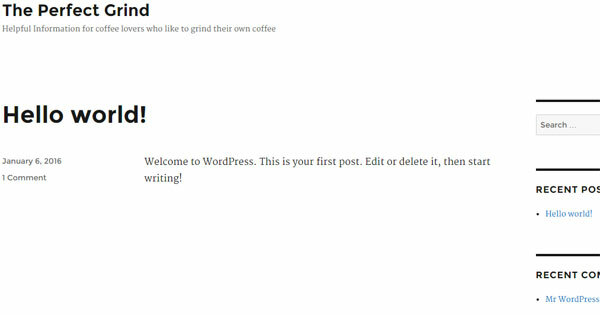 When you do, you will be taken to the WordPress dashboard for your website and it should look like this. In the left-hand corner, you’ll see the word ‘Dashboard’. This is essentially the ‘back end’ of WordPress – it’s where you can control anything that will appear on your website, and is where you can design your layout and add the all-important content. In summary, then, to be able to design and add content to your website you have to install some type of Content Management System (CMS). WordPress is easy to work with, already very well set up to be search-engine friendly, and is also very flexible in terms of adding design features. If you prefer to use another CMS system, that’s fine – but in this case study, I’ll be using and explaining WordPress, adding themes and plug-ins and adding content. If you opt for a different CMS, then you can skip to the section on understanding website structure.